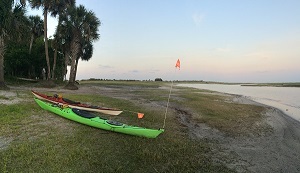 "I am so happy that we went on a guided kayak tour than visit the theme parks in Orlando. My team from India got to experience the trip of a lifetime." - Ghanshyam Dayal..."
Looking for the perfect gift? Give the gift of the outdoors! Looking for the perfect gift for your significant other, or that person who has everything? Give the gift of the outdoors with a kayak tour from Adventure Kayak Florida. Gift certificates are available for half and full-day tours, kayak camping adventures, and t-shirts. Call 904-404-6177 today! We'll take your order over the phone and mail your gift certificate to you or the recipient. 2-3 hour guided kayak tours that are offered at 7 locations around Jacksonville. These short tours are a great way to be introduced to kayaking. 6-7 hour guided kayak tours that depart mid-morning and finish up in the late afternoon, with a 1 hour lunch break in between. 2-day 1-night guided wilderness camping tours by kayak. All equipment is provided from tent to camp food. Just meet us at the put-in.